Miniature horse breeding Stallions owned by american miniature horse.com, HIGH COUNTRY MINIATURES, INC discloses the key for producing top quality miniature horses, start with the best quality proven bloodlines with excellent correct conformation and performance traits. 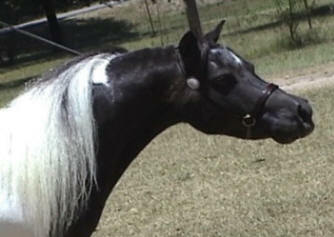 HCM WATERFORD'S NAMBE' AMHR (Cross Country's Waterford X HCM I AM A Pepper Too) Foaled: 3/19/2005 Approx 34". This superb stallion was sired by Cross Country's Waterford, a multiple halter National Champion Junior and Senior Stallion. Nambe' is producing extreme foals with outrageous action and connformation. 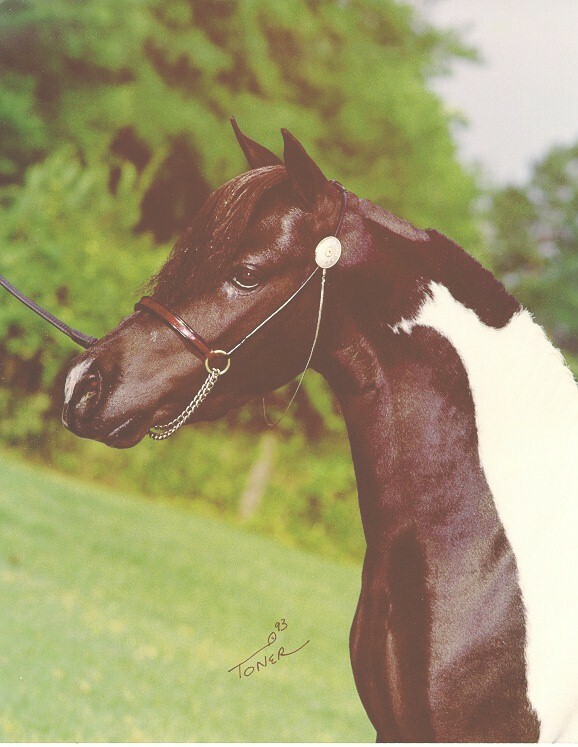 SIRE: "Cross Country's Waterford AMHA and AMHR Registered 34" Black Pinto Stallion - SOLD to Little King Farm in 2005. HCM NAVAJO'S X-CALIBER A sleek, high headed, homozygous pinto son of X-Caliber's Little Navajo who in the spirit of his pre-potent sire is making his mark siring outstanding, beautiful, and colorful foals. Follow the hyperlink attached to his name to learn more about this stallion and his pedigree. 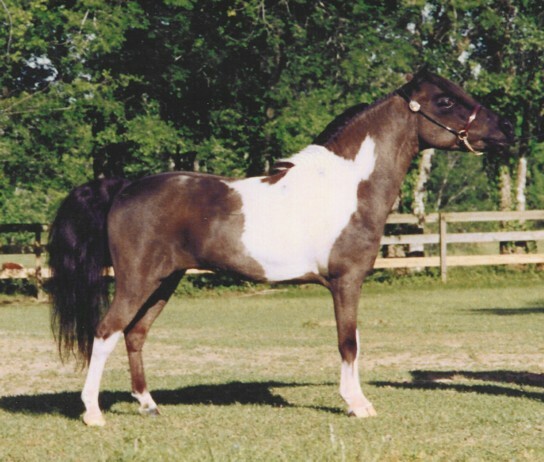 X-CALIBERS LITTLE NAVAJO * "NAVAJO" at 31.5" was a naturally beautiful and correct horse. He looked as good at 21 year of age as he did while he was showing. 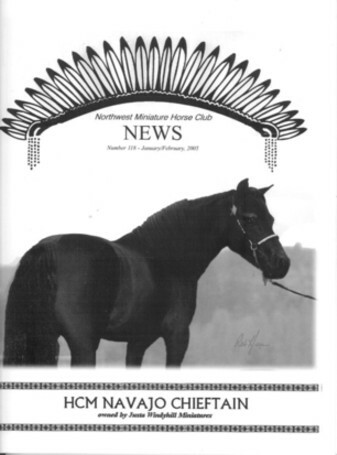 Navajo passed on to his get the quality traits that earned him twelve National titles in halter, color and harness and Reserve National Grand Champion Senior Stallion. This fact is evidenced by the number of his off-spring and grand get that are excelling in the National show ring. They are winning as junior and senior horses. Navajo is truly a Legend who passed on a legacy of beautiful, correct and refined offspring. National Champion Two-Year Old Stallion, National Champion Senior Stallion as a three year old, National Champion Senior Stallion as a four year old, Reserve National Grand Champion Senior Stallion, Undefeated National Champion Color Stallion four years in a row, National Top Ten Open Pleasure Driving, National Top Ten Get of Sire! What of his offspring?? Many, many National Top Ten halter Champions, National Champion Senior and Junior Mares, National Champion Senior and Junior Stallions, National Champion Amateur Junior and Senior mares and stallions, National Champions in Open Pleasure driving, many National Top Ten futurity winners in halter and driving. A true Champion passes on his Champion traits to his get, grand and great grand get. BOND SHOWBOY * We are proud to announce that X-Caliber's Little Navajo was DNA tested as a grandson of "BOND SHOWBOY" (28.5"). 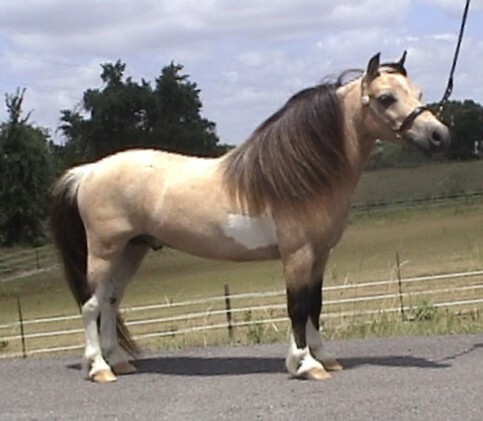 He is one of the foremost foundation stallions of the American Miniature Horse. 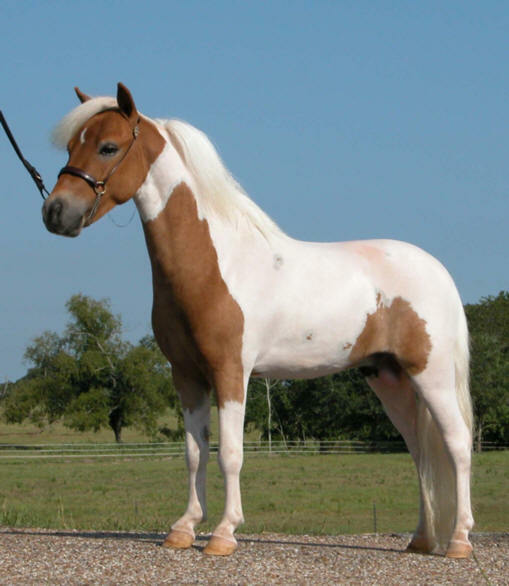 He is the sire and grandsire of many horse that have become champions; including, Reserve National Grand Champion X-Caliber's Little Navajo, National Grand Champion Bond ATOY4UC, Reserve National Grand Champion Bond Snippet, and national champion producer Bond Peppy Power. Many of todays best horses have Showboy in their pedigree. We were honored to have Showboy live with us until his death on October 15, 1998. Thanks for the memories! 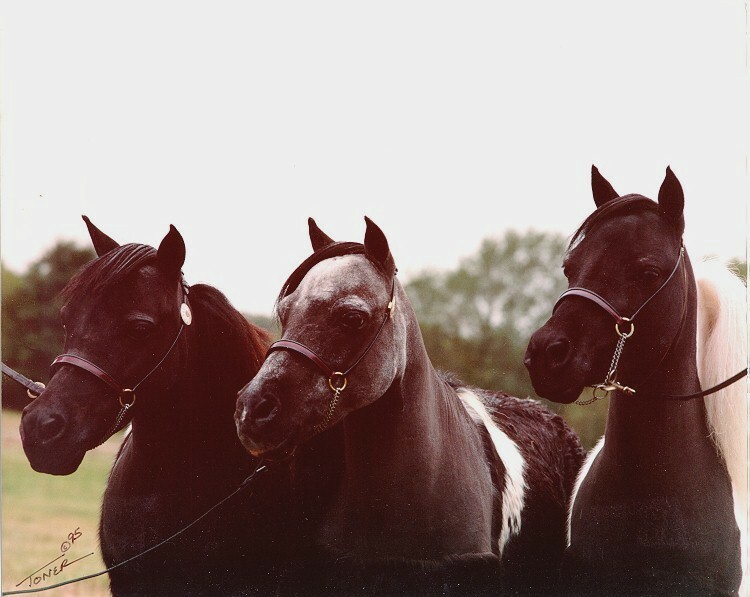 Pictured from left to right: Davis Fancy Playgirl (Navajos dam), Bond Showboy (sire of Playgirl) and X-Calibers Little Navajo. 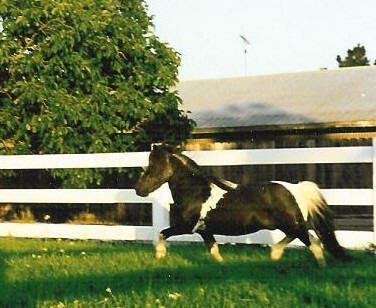 Motion photo of Bond Showboy taken in 1994 at 25 years old. Check out the knee action which is still being passed on many generations later.